A picture is worth a thousand words. Here you see a (766-Lb pull) Rare Earth magnet. The magnet is not what is important; rather, how/what it is captivating is the apotheosis in the advancement of detecting education. More specifically; the criticality of ADJUSTABLE iron discrimination. As you can see ..... ALL of these items have BOTH ferromagnetic AND conductive properties to each example/specimen. Some of these items NEVER gave a ID reading above iron. Some of the items ID'd (just barely) above iron......into the 'foil' conductive range. Some of the targets ID'd all over the entire spectrum of conductivity. And you wonder why detectors get confused and report erratic ID's. The photos are just a few examples of what can (and most probably will) be missed by most detectorists.......without proper education. One of the most interesting specimens/examples....is the rusted iron nail (actually a threaded screw) with a brass crown nut 'fused' on the top. This merged (become 'one') unit......gave a VDI ID of '14' on a F75 LTD. This is still within the parameters of the 'iron' range. (((A VDI of '15' is the highest 'iron' ID range.....and a VDI of '16' is the beginning of the non-ferrous range))). This is to say......in a multi-tone option on the F75.....it constantly ID'd as low-tone 'iron'.......remembering that a target of VDI '15' (and below) is a 'iron' low-tone target. With (1-tone) monotone invoked......and a Disc of '6'......this merged nail/crown-cap combo gave a very nice elongated (normal length audio) 'beep'. Stunningly educational target. 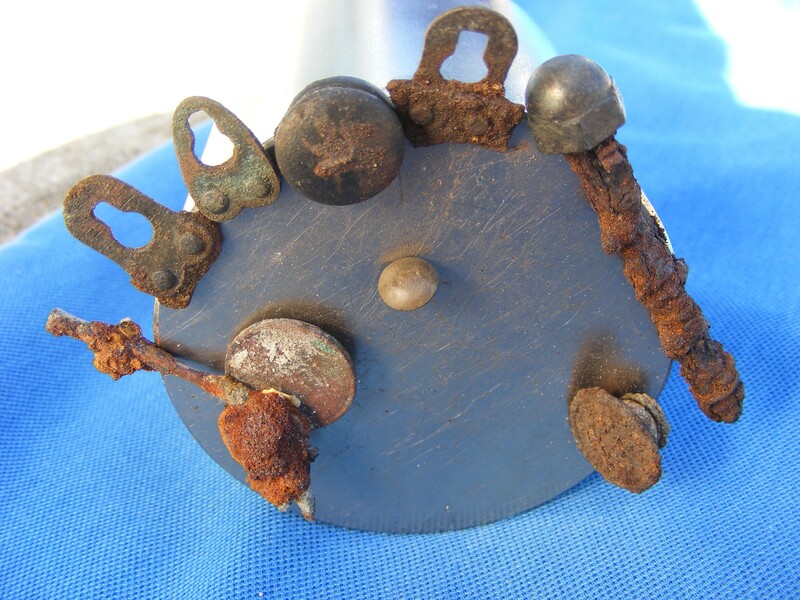 Notice the brass clasps with rusted iron retainers still attached. A MXT and Fisher CZ continuously ID's these targets as 'iron'. The F75 ID'd these clasps as non-ferrous 'foil' ID's......with the VDI bouncing between 18-24.....and with the Conf (Confidence) LCD bar-graph registering zero-confidence. Which detector(s) is right.......and which detector(s) are wrong? On some of these clasps.......the overall weight/mass of the iron portion outweighs the non-ferrous brass content. You would be remiss to 'blame' any detector for being correct OR incorrect. 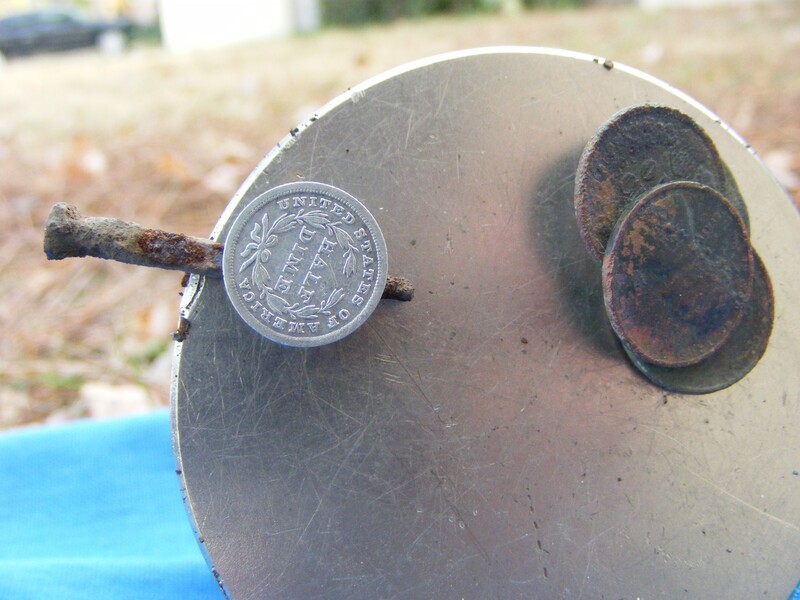 There are plenty of buttons and implements that have an iron backing......and a brass obverse/front. But ....... MORE importantly........ is the fact that many of these implements have a much greater percentage of iron mass/weight.......compared to the thin sheet-brass front. The bulk of the detectors on the market will ID these targets as 'iron'....... subsequently; will not be recovered. The F75/T2 platforms (and --speculating-- maybe the AT Pro) will ID these targets as 'non-ferrous' ...... with the VDI bouncing a wide array all over the conductive spectrum........but...........fortunately.......NOT as 'iron'. (((If only to 'enhance' this accolade/phenomenon to a higher order-of-magnitude))). 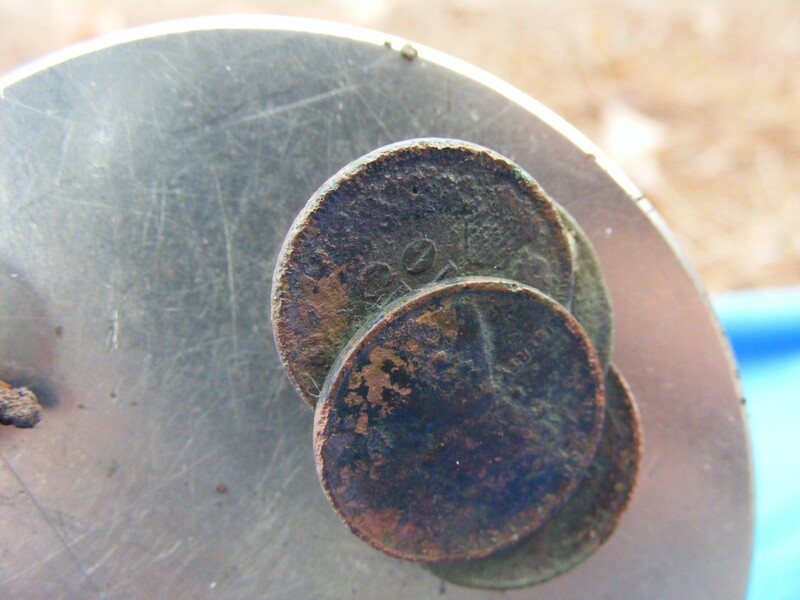 The clump of 4 pennies ID'd as a '96' on the F75 (excessively high.....and most folks would write-it-off as 'rusted sheet-steel'). 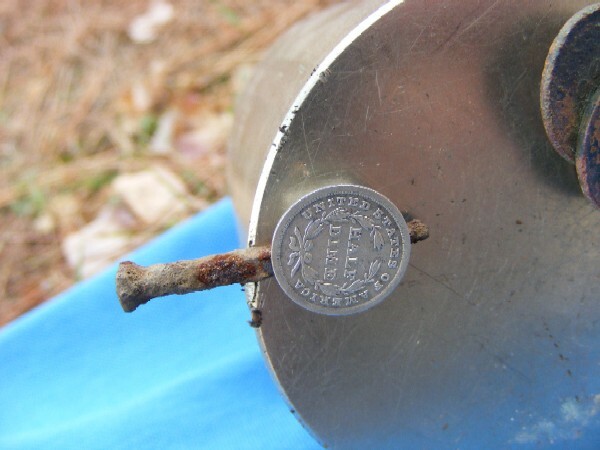 The CZ ID'd this penny clump as a high-tone......but......this high-tone sounded exactly like a "iron-falsing" high-tone......................a 'no-dig' high-tone. The Half-Dime (1839) is a work of art. It is very rare that a precious metal......such as annealed silver..... will 'bond' with a ferrous item.......but, here you can witness this extenuating example. I lost some critical data on this target during the recovery process.....and can only (at best) partially speculate the ID(s) of this collective mass. First.......when this target was initially detected....it ID'd as a VDI of '13' (with the numbers bouncing only a few points in either direction). When the target was excavated.....a independent (fairly small; about 1") rusted square-nail emerged from extreme close proximity to the "fused" mass. Once all other independent metallic items were removed from the excavated dirt pile........then........and only then.......did this coin/nail marriage start to show a entirely different set of ID parameters; primarily ID'ing in the VDI range of 19 - 26........ with an occasional low-90's (falsing) ID. 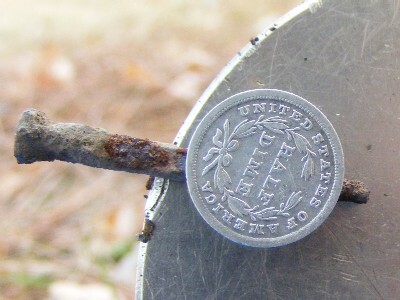 Normally.......when a coin is touching a nail.....the ID is (most of the time) a nearly correct 'coin' ID (albeit preamble/postamble audibly 'mushy'). In this 'fused' example.......the exceptional oxidation status of the square-nail ......along with long-duration bonding...... caused the ID to be unpredictably different. Metal detectors that discriminate 'iron'......the ENTIRE range of iron......(sometimes called 'notch' discrimination).......are NOT the type of units that qualify .....and should not be utilized.....in nail-infested relic hunting applications. High Resolution Iron Discrimination........where you can adjust HOW MUCH iron is to be discriminated......is of extreme importance. Do you want to discriminate the very bottom of the 'iron' range.....discriminate most of the 'iron' range.......discriminate an arbitrary amount (somewhere in the middle) of the iron range? The answer is "site specific". You MUST find the exact iron decomposition/decay status of YOUR particular site.....and adjust accordingly. 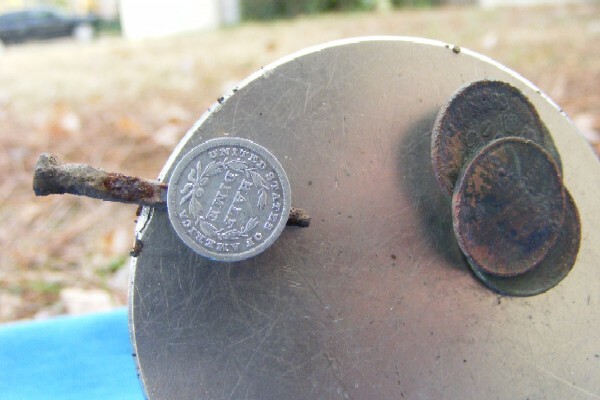 If the intent is to recover every non-ferrous target out of a particular site.....sweep the coil over a handful of excavated nails (spread out....and not in a clump/pile).....and start to adjust your Disc to -just barely- stop the elongated iron audio responses. Yes, you still want the nails to give 'some' audio response...........that being; snap-crackle-pop tick/click...........but not any measurable/lengthy audio report. --- These photos are of extreme high-resolution....so you can zoom in multiple times....to your likings.